By following a few simple guidelines, you'll be able to create a great looking timeline with Preceden that will be sure to impress everyone who sees it. Layers help you group similar types of events together on your timeline. They make it much easier for people viewing your timeline to quickly understand how it's organized. 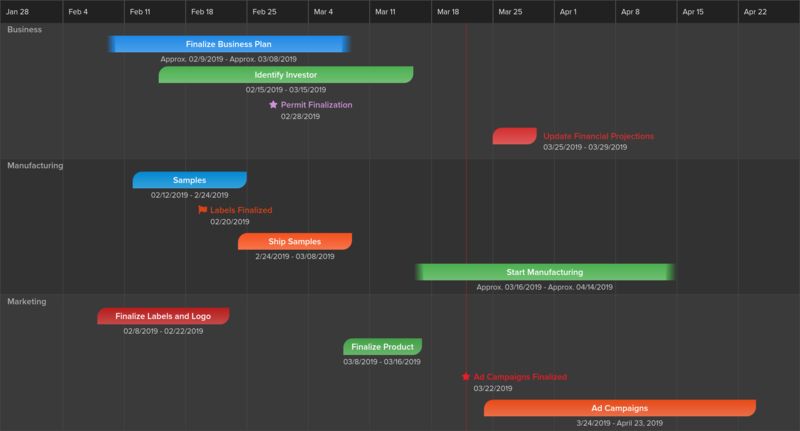 For example, if you're creating a project planning timeline, you might have some events related to the business, some events related to manufacturing, and some events related to marketing and advertising. Rather than lump them all together on the timeline, you can create 3 layers (Business, Manufacturing, and Marketing) and assign each event to one of the layers. ✅ Use layers to organize related events. ❌ Don't add all events to a single layer. One event: "Shipping Samples" with a start date of January 3, 2019 and an end date of February 2, 2019. Two events: "Start Shipping Samples" with a start date like January 3, 2019 and "End Shipping Samples" with an end date like February 2, 2019. Usually you'll want to lean towards the first option: using a single event to represent this. It will reduce the number of events on your timeline and make it easier for people viewing it to see that the event spans a range of time and is not just a point in time. ✅ Specify a start and end date when possible. ❌ Don't create 2 events to represent the start/end of a single event. Specifying that an event is a milestone makes it stand out by extending a vertical line through it that spans the height of the entire timeline. Done sparingly, milestones can help you highlight a few key milestones on your timeline. However, when more than a few events are made into milestones, it can easily clutter up the timeline. Timelines look the best with 3-4 milestones max. ✅ Only add a few milestones max to your timeline. ❌ Don't add more than 5 milestones. When you add an event without an end date to your timeline, Preceden displays an icon beside its name. By default, the icon is a solid circle. 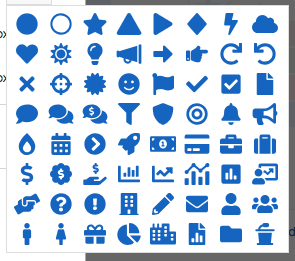 However, Preceden offers a wide variety of icons to choose from, many of which will be more meaningful that the solid circle. In addition to making your timeline look better, choosing an icon relevant to the event helps convey its purpose better to people viewing the timeline. For example, if you have an event representing an investor meeting, you could choose the icon with three people. For launching a product, you could choose the rocket ship. For closing your Series A round, you could chose the dollar sign or hand shake icons. ✅ Choose meaningful icons for events. ❌ Don't keep the default solid circle for every event. While it may be tempting to put as many details as possible into the name of an event, your timelines will usually look better if you keep the names short and place additional details in the event notes. Also, depending on the length of the event names and position of other events on your timeline, Preceden might not be able to display the full name on the timeline. ✅ Keep event names short and add additional details to the notes. ❌ Don't use really long event names. Switching the theme from a white background to one of many other colors. Specifying whether to display the dates and duration on the timeline and where to display it in relation to the event. Change the style of the events, add gradients, and more.